Notes: The second Brockley Whins station for a short time enjoyed some importance as an interchange on the main line to Tyneside from the south of England. Trains from the south approached via Boldon on the Pontop & South Shields line and a tightly curved wooden viaduct. From November 1848 main line trains could reach Newcastle by means of a temporary Tyne bridge, which the High Level Bridge replaced in 1850. In June 1849 seven main line trains called on weekdays in each direction at Brockley Whins, and five called on Sundays. The station building was designed by the celebrated architect G T Andrews and bore a resemblance to a number of others that he produced and which still survive in north-east England, including Shincliffe, on the ‘Old Main Line’ south of Leamside. The axis of the building was at right angles to the Sunderland – Newcastle platform, and it extended towards the curve used by trains to Washington and beyond, where there was probably a platform. The distinctive hipped-roof ground floor bay windows, favoured by Andrews, were found at each end, facing the platforms, and an arched porch was on the western elevation. The building was of large sandstone blocks, laid in courses, with a ridged slate roof. A two-storey section stretched east from the main axis, close to the southern end of the building, and also under a ridged roof. Beyond this was a single-storey extension. A further single-storey addition to the main building, also in sandstone, extended eastwards along the Newcastle platform, and yet another single-storey element, this time under a hipped roof, adjoined both of the previously mentioned extensions. To the west of the main building was a North Eastern Railway timber shed which was squeezed in next to the porch of the main building. The original low platform was eventually raised so that the lower part of the bay on the main building was partly concealed. The west-to-north curve connecting to the old Pontop & South Shields route diverged opposite the down platform so the up (Sunderland-bound) platform needed to be placed to the east of the down platform. Whereas the building on the down platform was substantial, the up platform was provided with a modest brick waiting shelter. The west end of the up platform and the east end of the down were connected by a barrow crossing, and a footbridge was added at an unknown date. On 1 October 1850 the new direct main line opened between Washington and Pelaw, and Brockley Whins was thereafter confined to dealing with trains between Newcastle and Monkwearmouth (Sunderland) and on the South Shields line, the latter ceasing in 1853. At this time there was little local population to serve but, using 1901 census material, the NER estimated that 4,295 people were within the station’s catchment. In 1911 ticket bookings stood at 63,708, the mining village of Boldon Colliery, over half-a-mile south of the station probably supplying most of the passengers. Whellan’s 1894 Directory of County Durham noted that ‘Boldon Colliery is a large village, comprising over 500 miners' cottages …there is a railway junction at Brockley Whins, which is the nearest railway station’. As Brockley Whins amounted to little more than a hamlet half-a-mile east of the station, and lacked easy access to it, the LNER renamed the station Boldon Colliery on 1 March 1925; the LNER had taken control of the former NER lines in the Grouping of 1923. Although the station was renamed, the adjacent junction continued to be known as Brockley Whins. 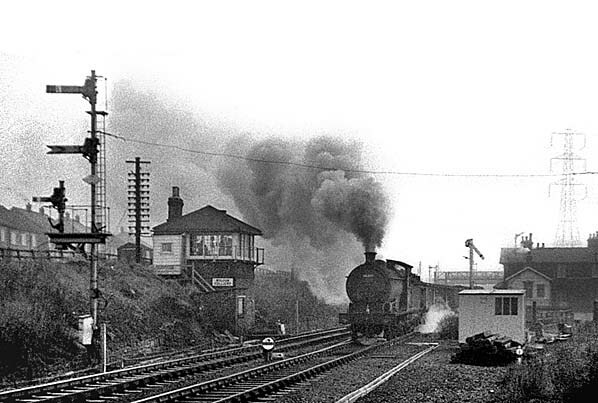 In January 1948 Boldon Colliery station became part of British Railways (North Eastern Region). In summer 1950 the train service was approximately hourly on weekdays with extras in the rush hours; 15 up and 21 down trains called. On Sundays there were 15 up and 16 down departures. In the late 1950s the station was fitted with BR(NE) tangerine coloured vitreous enamel totem name signs, but the LNER wooden running-in nameboards with raised lettering were kept and re-painted in tangerine. 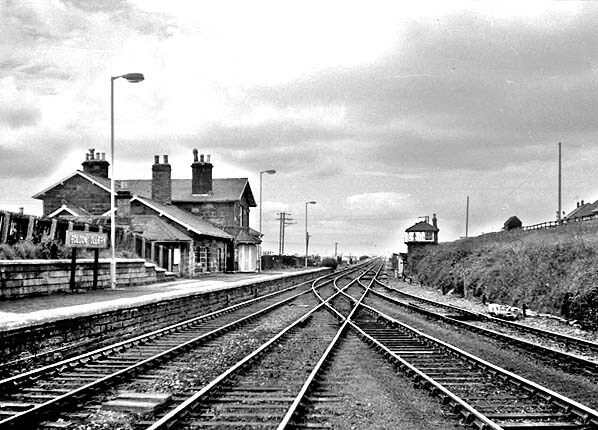 The Reshaping of British Railways (‘Beeching’) report of March 1963 did not recommend the Newcastle – Sunderland local services and stations for closure, although several stations on the route onward to Middlesbrough were earmarked and closed in 1964. Nevertheless, as part of the programme of withdrawing goods services from wayside stations, Boldon Colliery ceased to handle goods traffic on 9 March 1964. On 2 January 1967 the North Eastern Region was abolished and its lines and stations were transferred to Eastern Region management. The Newcastle – Sunderland local services were among those changed by the Eastern Region to ‘Paytrain’ operation in which, as an economy measure, booking offices were closed at all but the most important stations and tickets were issued instead by conductor-guards on the train. 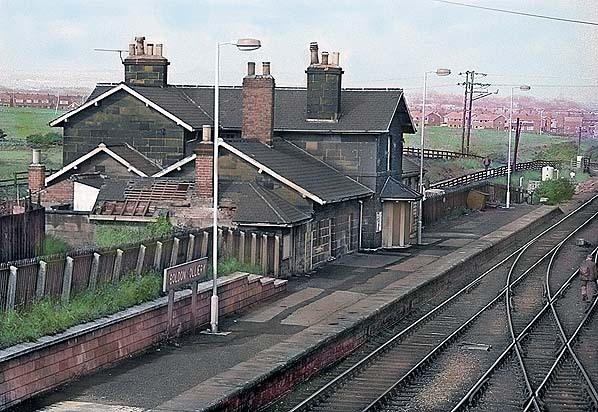 Boldon Colliery and all of the other intermediate stations between Newcastle and Sunderland (and on the South Shields branch) consequently became unstaffed on 5 October 1969. Without staff in place, station buildings were targeted by vandals and rapidly became derelict and dangerous. Boldon Colliery retained gas lamps, which required attendance by staff to light and extinguish, and within months of de-staffing most of them were broken. By 1971 the station received electric lighting on the tall vandal-proof standards favoured by the Newcastle Division of the Eastern Region, and the substantial buildings on the down platform were demolished soon afterwards to be replaced with a single ‘bus shelter’. The existing simple brick shelter on the up platform was retained. The LNER nameboards, minus some of their letters, were the only signage on the station by 1973 as the totems had disappeared, but in 1974/5 Corporate Identity name signs were installed. Since World War II housing development had reached Boldon Colliery station from the north. The colliery after which the village and station was named closed in 1982, and the decision was taken by British Rail to restore the station’s original name of Brockley Whins, which took place on, or shortly before, 8 July 1991. The station was re-signed with nameplates which, unusually, gave both the new and the old name and were in Tyne & Wear Metro cadmium yellow livery with the distinctive Calvert font, plus T&W and BR logos. Despite this Metro-style signage it was not until 31 March 2002 that the station welcomed Metro trains when the Pelaw – Sunderland – South Hylton service was introduced. In preparation for its transfer the ‘staggered’ up platform was replaced with one that faced the down platform and new platform shelters, lighting and signage were installed. Tickets from Michael Stewart, Bradshaws from Chris Totty & Nick Catford. Route maps drawn by Alan Young. 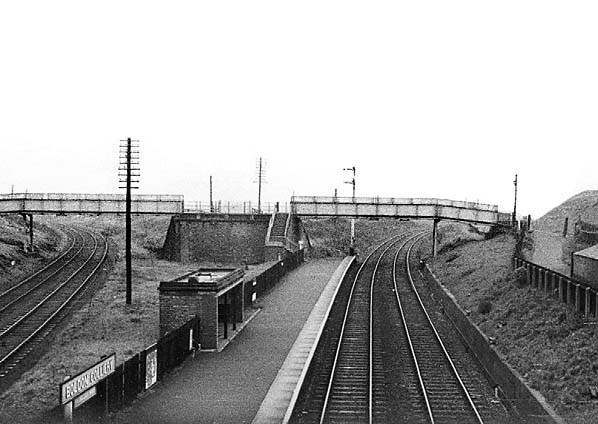 Looking west from the footbridge at Boldon Colliery station in 1962. The up platform is behind the camera. The down platform seen here retains its substantial building. The lines to the right lead towards Tyne Dock and South Shields and are used only for freight traffic. 1873 1:2,500 OS map. Brockley Whins station is in an almost uninhabited area, emphasising its origin as a passenger interchange station. By 1873 this function has ceased, as the line curving northwards carried passenger traffic only in the 1830s and 1840s, and the curve from the south ceased to carry passengers in 1850. Both lines are retained for goods and minerals traffic as a number of coal mines operate in north-eastern County Durham, and the line to the north leads to the south bank of the Tyne, about two miles away, and its coal exporting facilities. 1897 1:2,500 OS map. The station building at Brockley Whins can be seen in the angle between the east-west line from Newcastle to Sunderland and the tight west to south curve leading to the Pontop & South Shields line; between 1844 and 1850 main line trains between London and Gateshead/Newcastle used this curve. North of the station another line leads towards Tyne Dock, and from 1840-44 it was used by trains connecting South Shields and Gateshead which called at a platform at Brockley Whins, a short distance west of the station shown here. The staggered platforms can be made out, the up one (north of the tracks) displaced to the east of its neighbour. Some railway cottages are seen immediately east of the station in this otherwise lightly populated landscape. 1930 1:10,560 OS map. Brockley Whins station was renamed Boldon Colliery in 1926, and this is acknowledged on the map. 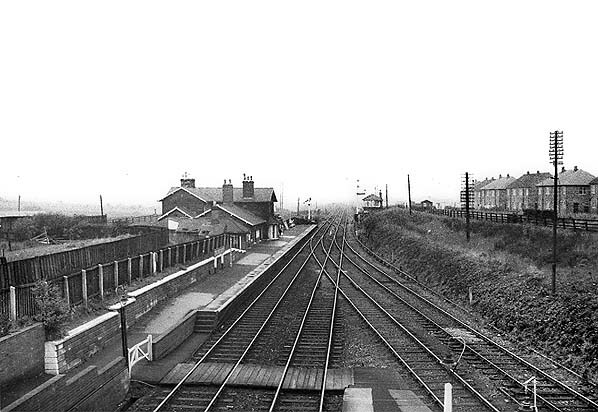 Little has changed at the station, but tracks have been lifted on the west to south curve beyond Boldon Colliery station, and the wooden viaduct over the River Don is shown to have been removed – although Hoole refers to its demolition taking place in 1940. A short section of the line has been retained as a siding at the station. Looking east from the footbridge towards the up platform at Boldon Colliery station. The facilities on this platform are basic in comparison to what is provided on the down platform, behind the camera: the LNER running-in nameboard , with the addition below it of ‘For Brockley Whins’, gas lamps, and the unappealing brick shelter are all that this platform has to offer. An ex-NER P3 0-6-0 locomotive is blasting its way towards Newcastle through Boldon Colliery station. Like their 0-8-0 NER cousins these simple, but reliable and effective, locos lasted throughout the NER, LNER and BR steam eras (LNER/BR class J27). The crews were paid a bonus depending upon the amount of coal moved, so they were generally seen and heard pounding along! One member of the class survives in preservation. Note the NER slotted post lower quadrant signal that remained at Boldon Colliery until all of the semaphore signals were replaced with colour light signals. 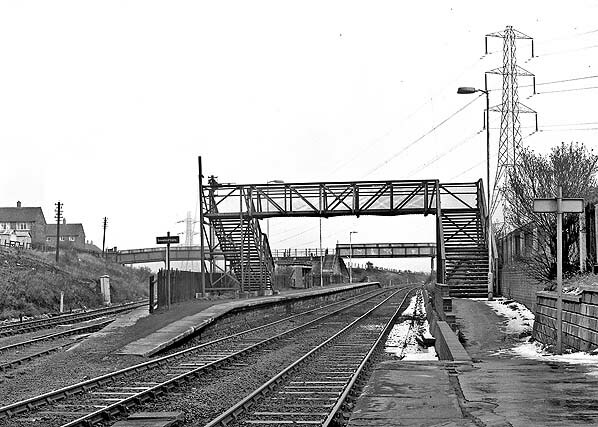 Boldon Colliery in March 1967, looking east on the down platform. The bay window of the station house is in the foreground. A Sunderland-bound DMU is standing at the distant up platform. The freight lines curving to the left lead to Green Lane Junction, Tyne Dock and South Shields. 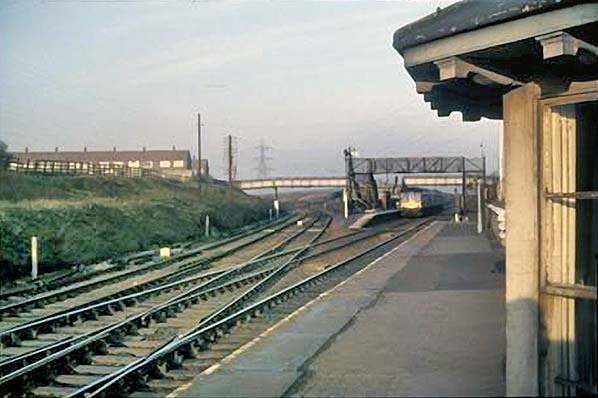 Looking east at the down platform of Boldon Colliery from the western ramp of the up platform in September 1970. The buildings are still in place, as is the LNER running-in nameboard. The signal box can be seen beyond the junction with the freight line from South Shields and Tyne Dock. 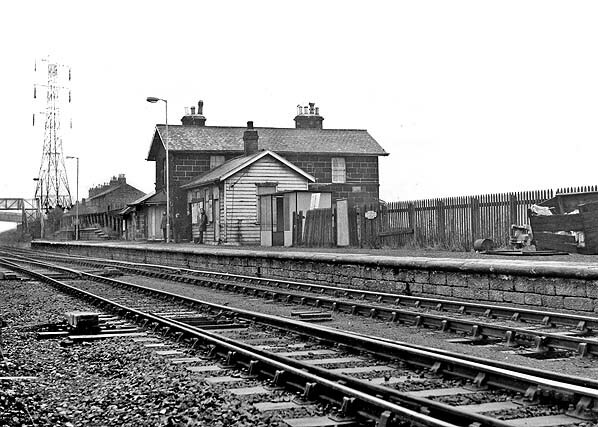 In December 1971 the down platform of East Boldon station is seen from the north-west. 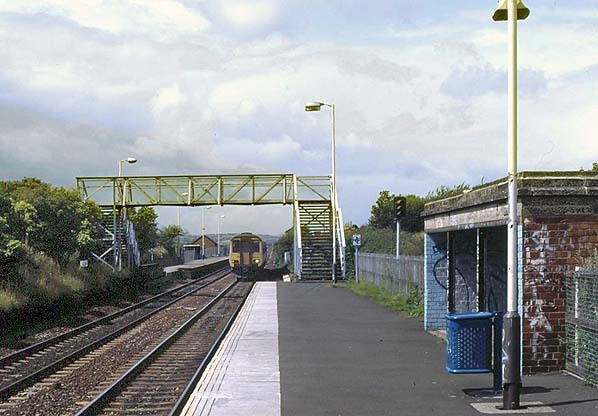 The station has been unstaffed since late 1969 and all of the buildings seen here would be demolished the following year; in anticipation of this a ‘bus shelter’ has been installed on the platform. A BR(NE) totem name sign is still fixed to the fence. The gas lamps have already been superseded by electric lighting. 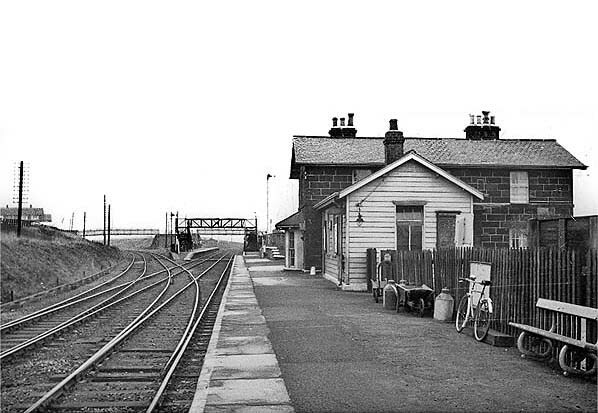 Looking east towards the up platform of Boldon Colliery station c1974. 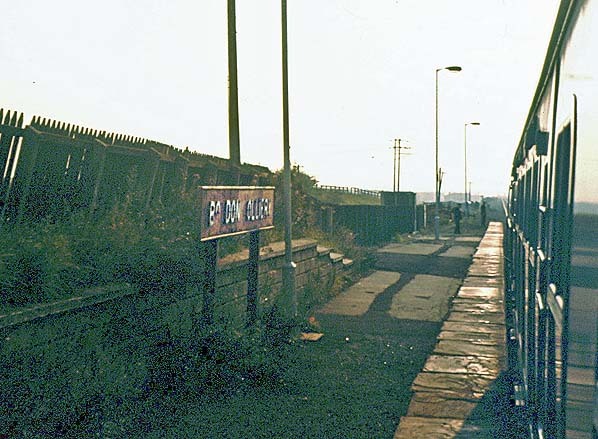 Boldon Colliery station’s down platform is seen from a Newcastle-bound train on 23 August 1973. All of the buildings on this platform have recently been demolished, and the only evidence of the station name on this platform is the LNER running-in board, painted in BR(NE) tangerine; some of the iron letters have been removed from the board by vandals. The lamps were installed c1970. Boldon Colliery station has recently been renamed ‘Brockley Whins’. On 3 August 1992 a DMU on the local service from Newcastle is arriving at the forlorn station. The brick shelter in the foreground on the up platform is the only building which survived the rationalisation of the station in 1972, and it is daubed with graffiti. The down platform, staggered to the west, has only a ‘bus shelter’ for passenger comfort. 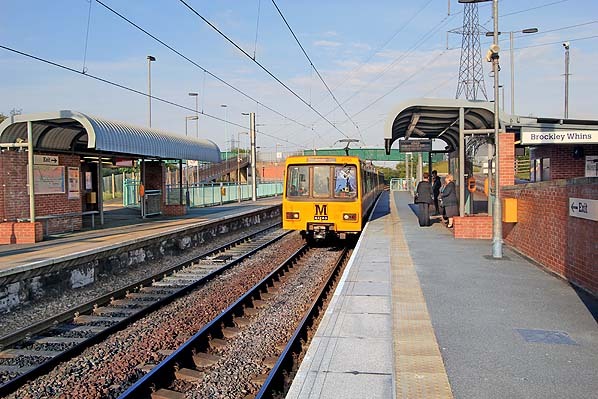 A Metro Train towards Newcastle arrives at Brockley Whins down platform in May 2013.